While Washington and Pyongyang have been busy powering up for a standoff over nuclear test and ballistic missiles, South Korea has shifted the playing field considerably for all sides. What happened was that Moon Jae-in was elected President of South Korea. The Korean peninsula was already bristling with the heady mix of tension, sanctions, nuclear testing, a dictator, a corrupt former President, severed relations, and, most recently, a glittering parade of ballistic missiles in the North. 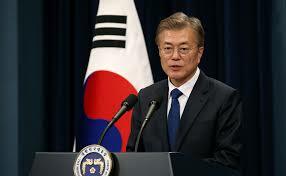 What will Moon bring to the table, and how is he different from his disgraced predecessor? His history, his career, and his words make it clear that he plans a new approach the ongoing problem of how to deal with the North. Even without South Korea in the mix, however, the North is mired in deep entanglement with the United States and, to a certain degree, China. Tensions are high all around. This past April speaks for itself. As Americans were preparing for the tax deadline, North Korea held a spectacular parade on April 15, showcasing an impressive if not terrifying barrage of ballistic missiles. North Korean Supreme Leader Kim Jong Un debuted his new weapons and then, two weeks later, conducted another nuclear test. That has put him and his administration on high alert over relations with U.S. President Donald J. Trump, who favors tough sanctions and a less-than-tolerant stance on Kim’s nuclear program. We have only to look at President Trump’s constant berating of former President Obama’s administration for enacting a dialogue with Iran. The subsequent deal with Iran over their nuclear program has been one of President Trump’s favorite events to criticize. We can gather that he’s not a fan of dialogue when it comes to wrangling an agreement with unpredictable foreign governments and their nuclear programs. As a result of the tough political stances taken by the current administration in Washington and Kim Jon Un, there’s now a standoff between the two countries. Nothing is moving forward except, apparently, Kim’s nuclear testing program and his ballistic missile fleet. Meanwhile, China, North Korea’s main partner in trade, has agreed to U.N. sanctions. They will ban the import of coal for the rest of 2017. More tension for North Korea. How Will Moon Jae-in View the Political Landscape? Enter Moon Jae-in, newly elected President of South Korea. He enters the presidency amid a tough economy and political scandal of the highest degree in his country. However, the main focus of his campaign was relations with North Korea. If you look at Moon’s past, you might well understand why North Korea is an important issue for him. The son of refugees from the North, he also witnessed first-hand the brutality and irrationality that can often characterize North Korean leaders and commanders. It’s been called the axe murder incident and it’s certainly brutal enough to have had a significant impact on Moon Jae-in. In 1976, when he was serving in South Korea’s special forces (all Korean men serve in the military for two years), two American soldiers set out to trim a tree. The tree was located in the DMZ and had grown branches that obscured the line of sight between the two sides. Both sides agreed that pruning action was needed, and the Americans set out with axes in hand. North Korea sent soldiers to the tree, but not to help. The soldiers murdered the Americans with their own axes. The commander of the U.N. forces in South Korea ordered a small battalion of South Korean soldiers to cut down the entire tree, in a symbolic act of strength. Moon-Jae-in was one of those soldiers. Indeed, he is also a human rights lawyer and takes a sympathetic stance on protecting the futures of the North Korean people. He states that he “hates” the North Korean system but sympathizes with the people who live under the oppressive regime. His family, after all, once hailed from the North. After a long period of conservative rule in South Korea, where the official policy towards the north was to take the hard line, Moon’s administration seeks engagement with the North. He sees the past ten years of antagonism resulting in nothing but escalated nuclear tests by the North and increased suffering of its people. Engagement, he says, must start now (but only after Kim promises there will be ‘results’ like freezing the nuclear program or even dismantling it). It remains to be seen how he’ll get talks started since Kim has always maintained, without wavering, that his nuclear program is non-negotiable. Any dialogue, no matter how small, would be a huge beginning. There has been no engagement between the North and the South at all since the Conservatives took power ten years ago. Even in the DMZ, there hasn’t been communication since 2013 (official communication, that is: soldiers use megaphones to parlay messages across the expanse). Reuniting with the North could mean massive turmoil for the South. It’s easy to see the benefits for North Korean people if they merge economies and cultures with the South. But what will the South gain? In the end, what happens on the Peninsula isn’t even up to Moon Jae-in, although his regime will play a large role in events. We have to look at a wider playing field, one on which China and the United States must be accepted as major players as well. And with President Trump now in the mix, it’s going to be eventful the next few years.